It’s that time of the week again. Welcome to another Freebie Friday. 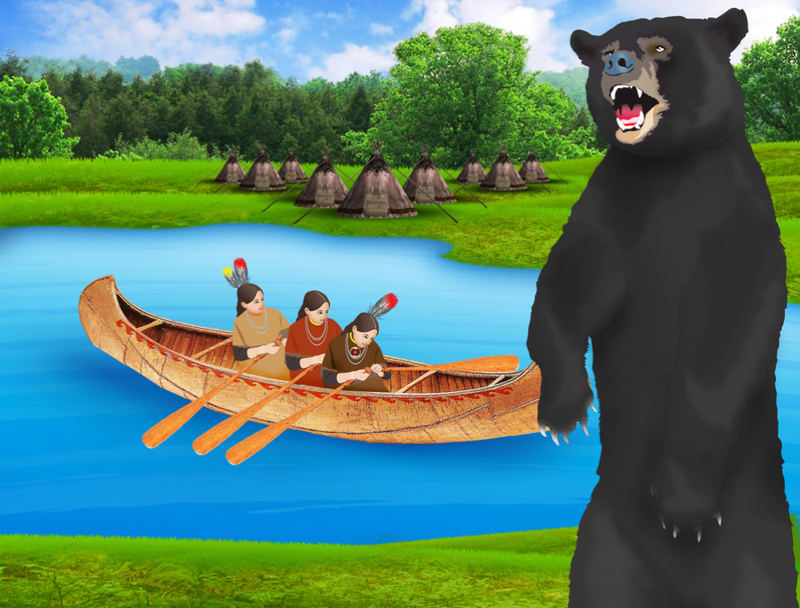 Today’s freebie is from Forgotten Trail and it’s clip art depicting a canoe on a lake, tipis in the background and a bear in the foreground. This clip art showcases a scene that you would encounter in the history of the plains Indians. View and download this clip art below. We like to provide resources, like the one here, because they supplement the content in our games. You can find other great teacher resources on our Teacher Resources page. There you’ll find activities, videos, powerpoint presentations, and more that you can use in the classroom, at home or for any other educational need. Also make sure to browse our teacher resources on other various educator sites. We have great math videos on our Teacher Tube channel since that may be more accessible to educators than other video websites. We also have more resources on our Teachers Pay Teachers page. Make sure to take advantage of the various resources we have to offer and come back next week for another Freebie Friday! Join Angie and Sam as they follow in their Ojibwe ancestors’ footsteps. Buy Forgotten Trail today!